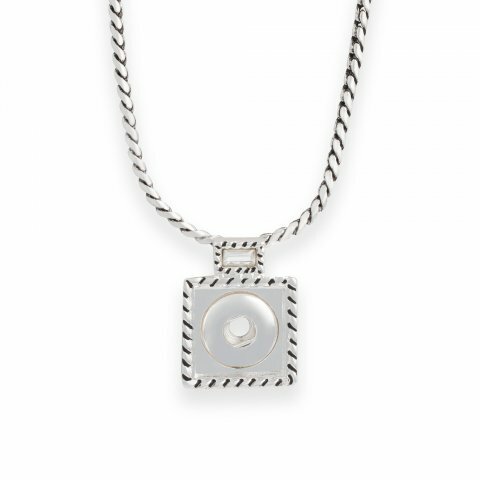 A single baguette-cut crystal is set above a silvered square snap, both of which are surrounded by antiqued rope frames to beautifully highly the Style Square Dot of your choice. My FAVORITE square necklace! I especially love it with ANY of the Square Couture Dots- a real stunner! I love this necklace with the new square couture Dots. Gorgeous. My clients love love this necklace and now with Square Couture Dots they have more options. This necklace is classic! It very light weight! I forget I have it on! This is my favorite necklace! This square allure necklace is my absolute favorite! I snap in the square mountain couture and the combination is to die for! Stunning and unique! I love the look with a Square Couture!